Dubai: The new fish market in Deira is gradually taking form, as officials confirmed yesterday that it will be completed by July — several months before its intended completion date. The Dh9.97 million project was launched in February 2013, which covers a total area of 3,000 square meters, is around 75 per cent completed. Upon completion, the market will follow the city’s new Green Building Code as part of the civic body’s bid to create a sustainable city and preserve the environment. Hussain Nasser Lootah, Director General of Dubai Municipality, visited the construction site yesterday, pointed out that it is set to become the emirate’s next tourist point of interest. “The Fish Market will not only be a place to buy goods, but will become a bridge between the past and the present, where tourists will be able to overlook the sea and be part of the daily morning auctions of fish — which is the traditional way of doing business among fishermen,” said Lootah. The current fish market is next to Deira Corniche and is home to an abundant number of boats that dock there on a daily basis and fish will be sold to vendors and visitors at auctions, from as early as 5am. According to officials at Dubai Municipality, the fish market will include 770 underground parking spaces, in addition to 700 outdoor parking spaces. “The second phase consists of a marine package and that includes a walkway. A key wall will also be constructed at a length of 600 metres, and that is what will separate the water and the land,” said Mohammad Mashroom, director of general projects department at Dubai Municipality. “A pontoon will be built, and that is one of the major features of the fish market as it will have a capacity of 65 boats, enabling them to load and unload their fish,” he said, adding that the project will be completed by the end of the year. The Deira Waterfront Development, Dubai, has appointed Hyder Consulting to carry out full design services of the Deira Fish Market project. The commission includes: architecture, MEP, structures, infrastructure, traffic engineering, geotechnical, environment, waste management, landscape and LEED certification services as well as marine engineering and fire and life safety. The concept design will be developed by CADIZ Design - adopted by Hyder's architecture team and developed through to construction documentation. A further opportunity for supervision services exists beyond this design appointment. 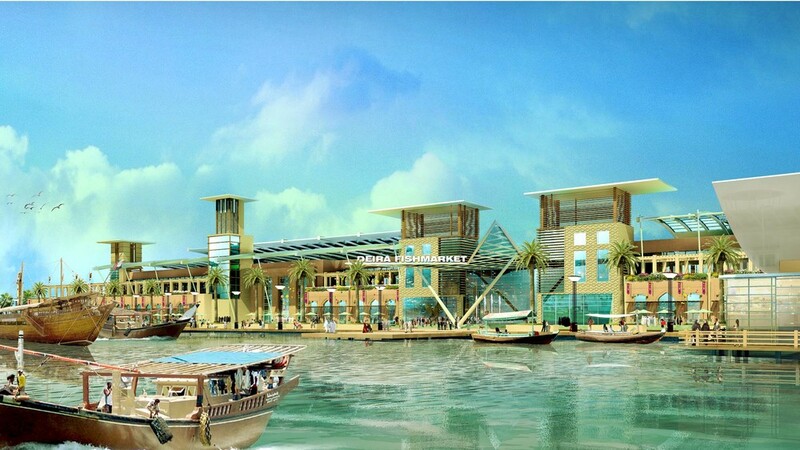 The project will replace the existing open air fish market in Deira - with a purpose built facility on Dubai Creek. Features of the new facility includes: a working marina to receive fishing boats; a souq area and various restaurants including two floating restaurants; two mosques including supporting offices and administration facilities. A leisure marina will also be incorporated in to the development. “This project win is the result of a sustained engagement with the client over a long period of time. Our continuous commitment to a prospective client helped us understand their needs and in turn allowed us to tailor an offering and fee that resulted in Hyder winning the project”. Greg Kane, Hyder’s Business Unit Director. Profile article on Medardo Cadiz, CEO of Cadiz International. Written my Mike Evans, the article is under the Archetype: Architects Deconstructed segment, in the magazine's Property Section. Originally published in InsideOut Magazine: 2003.